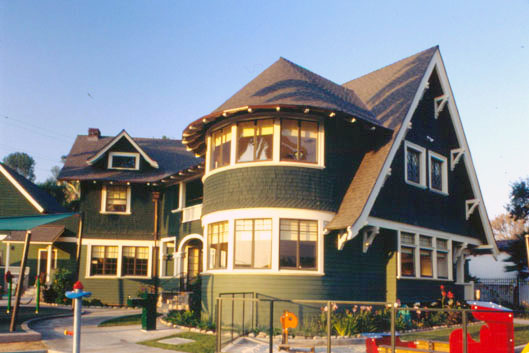 Built in 1904, the Ziegler Estate is a good example of early 20th Century Shingle-Style Architecture that includes both Victorian and Craftsman elements. Originally built for Charles Hornbeck, the home was soon sold to Roth Ziegler. In the 1950s, Carl Dentzel, then director of the Southwest Museum, purchased it as a potential addition to the Southwest Museum Complex, which also included the Casa de Adobe and the Braun Research Library. The home was acquired by the City of Los Angeles and is presently used as a child-care facility under the name of La Casita Verde. The home was placed on the National Register of Historic Places on October 3, 2003.